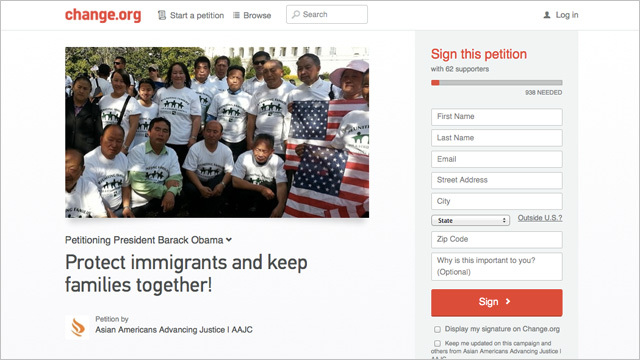 Helping to get the word out... Our friends at Asian Americans Advancing Justice-AAJC recently launched an online petition urging President Obama to go big and bold on executive action to stop or limit deportations and make other important changes to immigration enforcement. Protect immigrants and keep families together! We need changes to protest immigrants from deportation, reduce family visa backlogs, and end programs that encourage racial profiling. In light of the continued failure of the House to move progressive immigration reform legislation, it's more critical than ever for the administration to provide relief. 1. Provide expansive affirmative relief for all undocumented immigrants that protects them from deportation, allows them to work, and keeps their families together. 2. Ensure widespread use of prosecutorial discretion to limit the deportations of individuals with strong community and family ties to the U.S.
3. Reunite families by reducing visa backlogs that keep families divided for years. 4. End programs and practices that encourage profiling and undermine civil rights, including Secure Communities, 287(g), and immigration detainers. Immigration reform is and remains a top priority for the Asian American community. The majority of our community members are immigrants, including more than 1.3 million undocumented Asian Americans. We want and deserve immigration reform legislation that will bring people out of the shadows, reunite families, end profiling and strengthen due process and civil rights. The Asian American community and our allies have rallied, lobbied, prayed, fasted and been arrested to move Congress to pass humane immigration reform legislation. But many members of Congress failed to have the courage to do what is right. So now, we are looking to President Obama to stand with immigrants and their families to provide as much relief as possible. The President has said he will do what he can to help immigrants and we have to make him keep his pledge! By signing this petition, Asian Americans will send a strong message to President Obama that we want him to act with courage and compassion. Sign to the petition to President Obama here.